The last time I tried to give blood I couldn’t because my iron level was too low so prior to trying it again tomorrow I’m eating liver and other iron-rich foods. Last night’s dinner was fried chicken livers, sweet potatoes, and roasted Brussel sprouts, tonight it’ll be calves liver and bacon. Being the historicfoodie, I naturally wondered about liver and how it was eaten in times past. Calves liver was so often fried in bacon fat and served with the fried bacon that Good Housekeeping called it a classic in 2004. It is found in a very high number of 18th and 19th century cookbooks, although it is so simply prepared that its more an instruction than a receipt. It’s one of those classic foods that is simple and basic, but when properly prepared is a treat. Francatelli’s presentation was to place on a plate, spiral-fashion, alternating pieces of liver and bacon. Mrs. Radcliffe placed the liver on a dish and topped it with the bacon. Notice the contrast between Sarah Harrison’s simple instructions and Richard Bradley’s more complicated dish. “Calf’s Liver and Bacon fry’d. To be served with some Gravy and Butter, and a little orange or lemon juice, and garnished with sliced lemon.” – Harrison, Sarah. The Housekeeper’s Pocket Book. 1760. London. “Take some good middling Bacon, and fry it; then put in some Calf’s Liver, and cut it in thick pieces, pepper it, and salt it; and when it is enough, for it must not be fry’d hard, have ready prepared some cabbage lettuce, some white Beet-Cards, or Beet-Leaves, and some Spinach-Leaves, and chop them together, with some Parsley, but not too small; then chop some onion, and mix with the rest; then throw them into your Frying pan, with a piece of Butter, when the Bacon and Liver is out, and fry them till they are tender, and as brown as may be; putting in a spoonful of Verjuice, or the Juice of a Lemon, a little before they are enough. And having kept the Liver and Bacon hot all the while, pour these Herbs over them, which ought to be in good quantity”. – Bradley, Richard. The Country Housewife and Lady’s Director. 1732 and 1736. London. Liver and bacon wasn’t peasant food. It was a favorite dish of the English Chancellor, Sir John Scott, 1st Lord of Eldon (1751-1838). He was Lord Chancellor of Great Britain between 1801 and 1806 and again between 1807 and 1827. 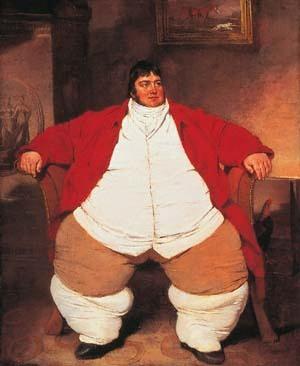 He once visited Sir John Leach who spared no effort to impress him by allowing him to choose anything that pleased him to be served at the meal, and, when Eldon chose a simple dish of liver and bacon, Sir John was much put out until Eldon assured him he meant no slight to his hospitality and that it really was his favorite fare. Cookery books contain instructions for making it, and hotels and restaurants routinely served it well into the 20th century. While I don’t recall seeing it on a restaurant menu with bacon, liver, usually liver and onions, is still found in restaurants and we often order it when it is. When I make liver at home I soak it in a little buttermilk then drop the pieces into a plastic bag with seasoned flour. The batter gives it a nice flavor which is enhanced further when served with crispy bacon. Blissful Meals, yall, I’ll add a photo later. Photo: Right: The celebrated Daniel Lambert who weighed 739 lbs. when he died in 1809. Left: Chauncy Morlan, early 19th century. This is a follow-up post on obesity and weight loss from earlier this week. 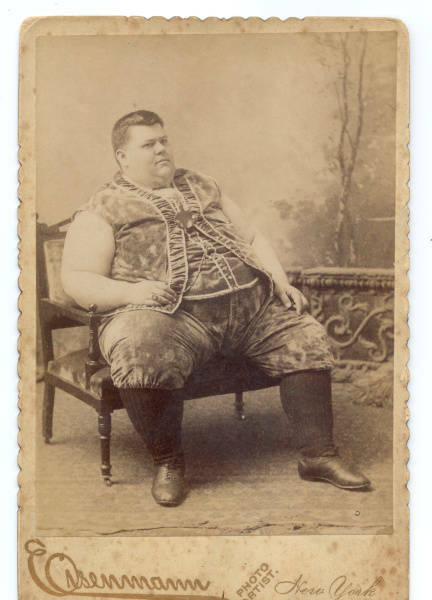 Continuing with Dr. William Wadd’s treatise on obesity, we find several instances of gentlemen who lost goodly amounts of weight although by today’s standards perhaps not by the healthiest of means. For example the gentleman who took nothing other than tea and a few biscuits until he was satisfied with his weight and agility. He documented weight loss and improved health by Catholics through their observance of Lent, a time of fasting, or at least giving up certain luxuries between Ash Wednesday and Maundy Thursday or Easter Eve (depending on your church’s interpretation, it is generally 40 days). I found his comments interesting as giving up all sweets for Lent is part of my current diet strategy. Dr. Wadd also mentioned briefly the pros and cons of using vinegar in a weight loss regimen, which I found interesting since I have a container of vinegar fermenting in our pantry which might contribute to my weight loss regimen. At the very least, my pantry smells heavenly. We enjoy shrub which I make from juice, usually blackberry juice, good vinegar, and sugar. It is added to cold water in any quantity to suit the palate and is quite refreshing. My last batch was made with a combination of blackberries and blueberries (not a fan of the blueberries, and I intend to tweak the batch). The reader may remember a product patterned after shrub and sold as a health drink called Jogging in a Jug. The Spanish General, Chiapin Vitellis, supposedly reduced his size so much by drinking vinegar that he could, “fold his skin around his body”. That is not a pleasing picture or one I aspire to, but vinegar has been known to have health attributes for centuries. “It was the common drink of the Roman soldiers: every one was obliged to carry with him a bottle of it, which was occasionally mixed with water…”. “The Ancients were so sensible of the Force of Stimulating in this Case, that the celebrated Remedy against Fat was a certain quantity of the vinegar of squills taken every morning…”. Squill grew around the seacoast of the Mediterranean, although it was not confined only to the coast and was abundant in southern Spain, Portugal, Morocco, Algeria, Corsica, southern France, Italy, Malta, Dalmatia, Greece, Syria, Asia Minor and it extended to the Canary Islands and the Cape of Good Hope. It was documented as being cultivated in England in 1648 in the Oxford Botanic Gardens. The Ancients who wrote of vinegar of squills included Pliny and Dioscorides. Sources: Arbuthnot, John. An Essay Concerning the Nature of Aliments, and the Choice of Them. 1735. London. Wadd, William, M.D. Comments on Corpulency. 1829. London. Botanical.com online version of – Grieve, M., Mrs. A Modern Herbal. 1931. Alabama state employees have been asked to participate in Scale Back Alabama, a program where teams of four compete with each other with the goal of losing 10 lbs. in 10 weeks, and today was weigh-in. Don’t think for one minute I’m about to tell you my weight, but I will from time to time report on my progress as I attempt to shed those 10 lbs. It’s no secret that a high percentage of Americans are overweight, and Alabama ranks #4 out of 50 states with the worst obesity problem. The three states that top that are West Virginia, Louisiana, and Mississippi, in that order. We all want to be healthier and for many of us the first step is weight loss, but how is a historic foodie to pursue the craft of cooking that is so much a part of her life and manage a healthy weight and exercise level? For answers, I turned to early sources hoping they might provide some incentive to eat healthier while exercising more. The following letter was published in 1829. 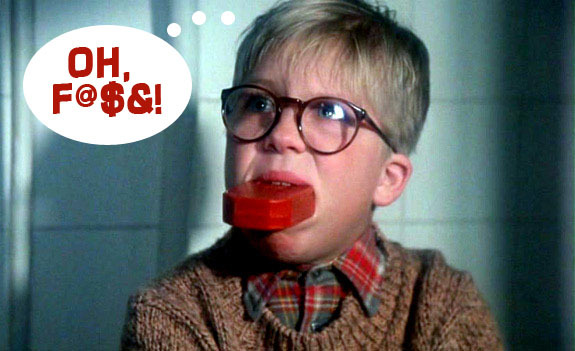 “From a fat Sportsman. Having had some conversation with you upon the subject before, and hearing that you have made it a matter of study, I am desirous of inquiring your opinion further—as to the safety and treatment by which weight may be diminished by medicine. I am growing heavier and fatter than I wish to be (my ordinary weight, a few years ago, was fifteen stone, and I am now increased to nineteen). The exercise I take does not prevent it at all. I should not quite like to be put on a regimen of abstinence, but upon some system which, with moderate living, might gradually bring me back to about my old standard. All this time I am quite well, and should have little to complain of, were I not fond of sports which I pursued with greater convenience when I was thinner, and did I not observe that persons inclined to increase in size lose their activity rather too soon in life”. William Wadd, to whom the letter was sent, observed the gentleman and agreed that, “he could not get through the woods so easily as he used to do”, and “it was not so easy as formerly to find a horse to carry him”. His advice to the sportsman? “Keep your eyes open, and your mouth shut”. The sportsman could have greatly benefitted from abstaining from the two gallons of ale he admitted to ingesting daily, instead he sought weight loss pills from the good doctor. Wadd noted men who had successfully lost a great deal of weight due to financial failure and extreme poverty or by being imprisoned in some tower without access to food save what was brought to them. Hopefully I can lose my 10 lbs. without my team-mates locking me in the basement for the next 10 weeks or suffering a debilitating loss of income which leaves me unable to purchase food. If I’m lucky, I’ll continue on and re-lose the 40 lbs. I’d lost prior to coming to work here when I gave up walking the three miles per day that helped me lose it in the first place. Over the next few weeks we’ll explore modern diet theories and try to rationalize them using 18th and 19th century sources. Blissful Meals Yall. Hide the gravy and pass the salad. It is common knowledge Indians ate acorns and were proficient at preparing them, however, how many of my readers know that as recently as 1917 they were being recommended as a source of food during WWI? There are some 50 species of oaks in the U.S. and around 30 of them are found in the Southeast. A tribe in California stored dried acorns in baskets so air could circulate and prevent molding and used them to make mush and bread, while another also buried them in boggy areas near cold springs and allowed them to swell and grow soft. “They turned nearly black in color, but remained fresh for years”. They dug out a quantity and roasted them. Eastern tribes preferred the sweeter varieties such as those from the white and chestnut oaks, but did eat any variety in times of scarcity. 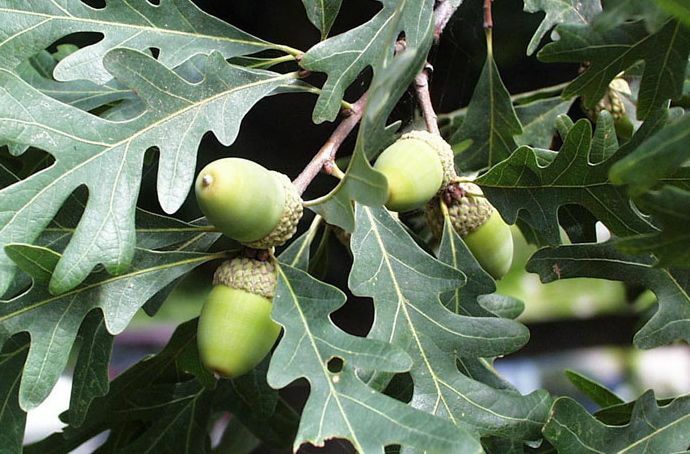 The Choctaw in Louisiana were noted to make flour from the acorns of the water oak by pounding it and letting water run through it in a basket to rid it of its bitter taste. *Red oak leaves have pointed lobes, the leaf varies in shape, but always has points on the lobes. During the war, an enterprising woman used acorn flour in bread baking and wrote that they were useful as a binder when used with corn meal or other coarsely ground gain used in making bread. 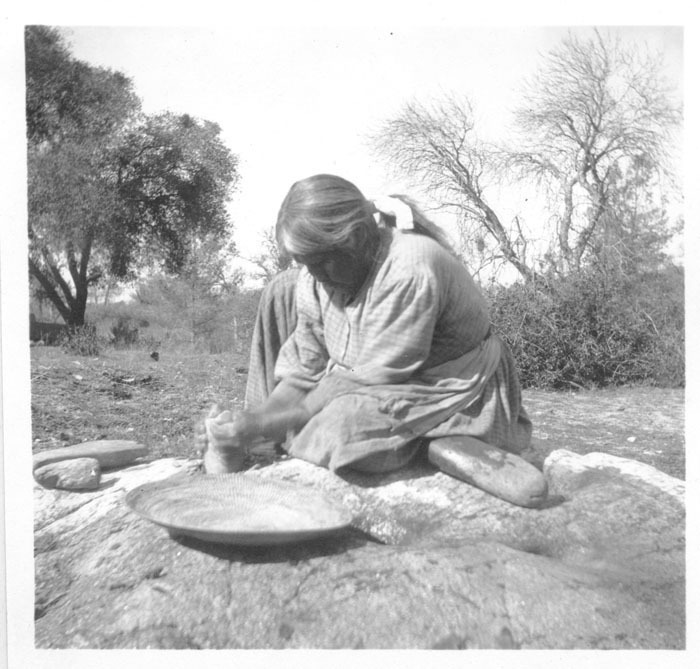 She thought mush or bread made wholly of acorn flour less pleasing to her taste, but was altogether pleased with the result when combining one part acorn flour to four parts corn meal or white or whole wheat flour. 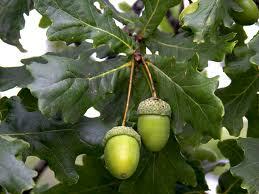 The white oaks produce short stubby or round acorns while the red-black oaks produce acorns longer in shape than round. If the acorn’s cap is smooth and shiny, the acorn is from the white-oak family, if fuzzy in appearance, it is from the red-black oak. In a non-historic setting, when your goal is simply to make flour, it is not necessary to grind the nuts using ancient techniques. Crack the nuts, using a nut-cracker can speed up the process, and cut the nuts into small pieces. Wrap the pieces in cheesecloth, and secure with string. Boil the nut meats in successive changes of water to remove the tannin. The tannin can also be removed by submerging the bundle in water and soaking them for several days, changing the water daily. With either method, they are ready to use when the water remains clear. The acorn meat will have lost much in color and can be used at that point, or dried in the sun, a dehydrator, or low temp in your oven. When dry, the pieces can be put through a grinder, food mill, or run through a food processor or blender, or even put into a cloth bag and pounded to produce flour. Method #2: Pound the acorns and remove the hulls. Put the fresh acorn meats in a blender with water and grind them to a pulp. Put the pulp in a towel-lined colander and run water through it or put it in a cloth and swish it in water to remove the tannin. Squeeze out all the excess water and either use the flour, dry it, or freeze it. I have processed acorns for making ersatz coffee as was done in times of shortage in various cultures. Sources: National Geographic. Vol. 34. Aug. 1918. The Operative Miller. Jan. 1919. Boys’ Life. Oct. 1983. Oct. 1977. Bennet, Richard and Elton, John. The History of Corn Milling. Vol. I. 1898. London. This is part 3 of today’s post on Native foods and was penned in a description of the Indians of North Carolina. Perhaps the reader may wish to compare the subtle differences between the three areas (Maryland, Georgia and neighboring Alabama, and North Carolina). Spelling is unchanged from the original book. I saw an episode of Preppers about an Apache man named Snake Blocker whose idea of surviving a catastrophe of epic proportions was to live off the land as his ancestors had. He has a better than average chance of doing so, however, his wife wanted no part of his foraged tidbits. I’ve thought about the program, and turned to original 18th century sources for a refresher on native self-reliance. Source: A New Collection of Voyages and Travels. Ed. Stevens, Ed. 1711. London. The dried corn was beaten in a mortar, boiled for hominy, or missed with hickory-nut-milk, walnut-oil, or fresh bear’s-fat, was baked into bread or fried as cakes. Oil was skimmed off the top of water in which walnuts or hickory nuts had been boiled, and stored in covered earthen jars to be used on corn-cakes. Bread was also made from pounded sunflower seeds. Persimmons and grapes were dried and stored for winter. Jones enumerated several ways they obtained salt which he says they had in abundance. Soruce: Antiquities of the Southern Indians, Particularly of the Georgia Tribes. 1873. NY. The following is taken from Thomas Salmon’s Modern History: Or, the Present State of All Nations, 1746 and it capably and adequately discusses the foods of the Native Americans. The following pertained to the tribes of Maryland. In times of want, the information will serve us well today. They eat fish, flesh, and fowl of almost all sorts, and even some species of snakes and insects such as grubs, the nymph of wasps; some sort of scarabaei, cicade, &c. They eat also peas, beans, and all manner of pulse parched and boiled. Their bread is made of Indian corn, wild oats, or the seed of the sun-flower; but they never eat bread with their meat. They had no salt, but used the ashes of hickory, stick-weed, or some other plants that afforded a salt-ash, to season their meat. And there is no food they seem fonder of than the green [fresh] ears of Indian corn roasted; for which reason they plant it at different times in the spring that the season may last the longer. They stew their meat most commonly. They also broil and toast it against the fire, and frequently put fish and flesh into their hommony (which is Indian corn stewed over a gentle fire for ten or twelve hours, until it is as thick as furmety or buttered wheat.) They either broil their meat upon the coals, or on a hot hearth, and frequently dry it upon a wooden grate, which stands very high above the fire, which they call barbecuing it; and this dried flesh they usually take with them on a march, or in their hunting expeditions, and stew it as they want it. They flea and embowel their venison and other meat as the Europeans do, and pull and draw their fowls; but they dress their fish without gutting or scaling; however, they do not eat the guts, as the Europeans do those of woodcocks and larks. The stewed umbles [humbles, organ meats] of a deer is a great dish with them, and the soup made thereof much admired. Their desert consists of dried peaches and other fruits. They eat no kind of salads or sauce with their meats, [I have found numerous accounts to the contrary] but boil roots with it, and make it pretty savoury with pepper, &c. in the dressing. They eat also trubs, [?] earth-nuts, wild onions, and a tuberous root called Tuckahoe, which grows in boggy grounds and is about the bigness of a potatoe which it resembles in taste. Salmon went on to describe how the Indians hunted deer, hare, rabbits, opossums, raccoons, etc., and their methods of providing fish for their hominy pots. Benjamin Martyn, an English writer and official, wrote about his surroundings and experiences in Georgia, and since his account is interesting in regard to common foods I will share a bit of it today. When writing of the area in and around Savannah he also commented on Darien, GA which is near and dear to my heart since I first met Martin there while cooking for the garrison. We abound in the necessary conveniences of life, are well supplied with fresh provisions, viz. beef from 1 d. ½ to 2 d. ½ per lb. Pork from 2 d. to 2 d. ½ per lb. Veal from 2 d. to 3 d. per lb. Mutton (being yet very scarce) is from 4 d. ½ to 5 d. per lb. Tame fowl we have plenty of, therefore seldom buy any, nor wild fowl, and fish, which we abound with.—Mr. Harris, who is an expert Fowler, sometimes goes out with his Gun, and seldom fails of bringing in either Wild Turkey, Curlews, Rabbit, Partridge, Squirrel, Ducks or Geese, (in their season) sometimes Venison, but that, and Bear, &c. the Indians supply us with often. As to our liquors, we have wine; chiefly Madeira or Vidonia, which cost us from 3s. to 3 s. 6 d. a gallon; strong beer 20 s. per barrel, of 30 gallons; cyder 10 s. per barrel. Our small beer we brew of molasses, and is cheap. Coffee about 18 d. per lb. Tea from 5 s. to 7 s. per lb. The finest wheat flour is at 1 d. per lb. I bake my own bread generally with half wheat, and half Indian wheat flour; the Indian wheat [corn] is sold from 10 d. to 18 d. per bushel, is well tasted and very nourishing bread. The finest rice is sold here from 3 s. 6 d. to 5 s. per hundred weight. We have good store of pulse, roots, and potherbs, such as pease, and beans of divers kinds, (many of them yet unknown in England) pompions, musk and water melons, potatoes, and generally all the roots and herbs used in England. As to our Fruit, the most common are peaches and nectarines, (I believe that I had an hundred bushels of the former this year in my little garden in town) we have also apples of divers kinds, chincopin nuts, walnut, chesnut, hickory and ground nuts; several sorts of berries, besides those common with you; very good grapes; but no oranges grow nearer than Amelia to the Southward. We have exceeding fine water at Savannah, fire wood very reasonable; such as have houses of their own, have no other Burthen than performing or paying for their guard duty in their turn. There are no Taxes; all publick Buildings, and other such Works, such as Bridges, Roads, &c. have been carried on at the expense of the Trustees. I have not seen any part of the World, where persons, that would labour, and used any Industry, might live more comfortably. Source: Martyn, Benjamin. An Impartial Enquiry Into the State and Utility of the Province of Georgia. 1741. London. Accounts describing the foods of the New World are plentiful and seeds of those many crops were quickly taken back to European gardens where they were grown either as food or ornamentals. Corn was a generic term for various types of grain but for Americans it soon came to refer singly to maize. The reader will find beans and corn grown in America in the material quoted below. Because corn was unknown to the Europeans, we can unearth detailed information on how it was grown, eaten, and preserved, some of the beans are a little harder to pin down. The writer said the coarser part of the corn pounded with a mortar and pestle was boiled to render it tender, then a quantity of the finer meal was added to make good bread. He thought the best use of maize was in samp. Having first watered it about half an hour, and then beaten it in a mortar, or else ground it in a hand or other mill, into the size of rice, they next sift the flour, and winnow the hulls from it. Then they boil it gently till it be tender, and so with milk or butter and sugar, make it into a very pleasant and wholesome dish. This is the most usual diet of the first planters in these parts, and is still in use amongst them. Quite a bit of searching revealed one source that mentioned growing turkey beans with a foot note defining them as French beans [“green” or snap beans]. The U.S. Dept. of Agriculture called them, “Long pod or ‘turkey’ beans’”. Another source noted they were very commonly grown in the Dutch settlement of New York. Finding the early turkey bean among the heirlooms grown today isn’t an easy task. The name may have been attached to a variety of seed beans sold from the country, Turkey, or it might possibly be a forerunner of today’s turkey craw bean. The former is more likely, although Col. Francis Taylor did write from Orange Co., VA of goosecraw beans in 1794. Urban legend has it the turkey craw beans were cultivated from seeds obtained from the craw of a turkey (some say goose) that was being cleaned and prepared for cooking. Castelvetro wrote that the Turkey Bean was the least well known and the largest of the known ‘Turkish’ beans and that they were white or flecked with pink and tan. He went on to say the pods of those Turkish beans, “make excellent salad”, when young and tender. Van der Donck wrote in 1656, “The Turkish beans which our people have introduced there [America] grow wonderfully; they fill out remarkably well, and are much cultivated. Before the arrival of the Netherlanders, the Indians raised beans of various kinds and colours, but generally too coarse to be eaten green, or to be pickled”. He went on to say they were planted with corn and the corn supported the vines, which tells us they were pole, or runner, beans. It is possible the Turkey bean is a New World bean that was cultivated and perfected outside the Americas and then brought back to America with new settlers. Christian Johnstone penned a receipt for, “Kidney or American beans, and Turkey beans” which gives credence to the theory that the seed were sold from Turkey. Sources: The Philosophical Transactions of the Royal Society of London. 1809. Jameson, John Franklin. Narratives of New Netherlands 1609-1664. 1909 edition. NY. Murray, William, Sir. Ochtertyre House Booke of Accomps, 1737-1739. 1907. Edinburgh. Monthly Report Department of Agriculture. Papers Relating to the First Settlement of New York by the Dutch. 1886. Edinburgh. Castelvetro, Giacomo. The Fruits, Herbs, and Vegetables of Italy. 1614. Van der Donck, Andriaen. The A Description of the New Netherlands. 1656.